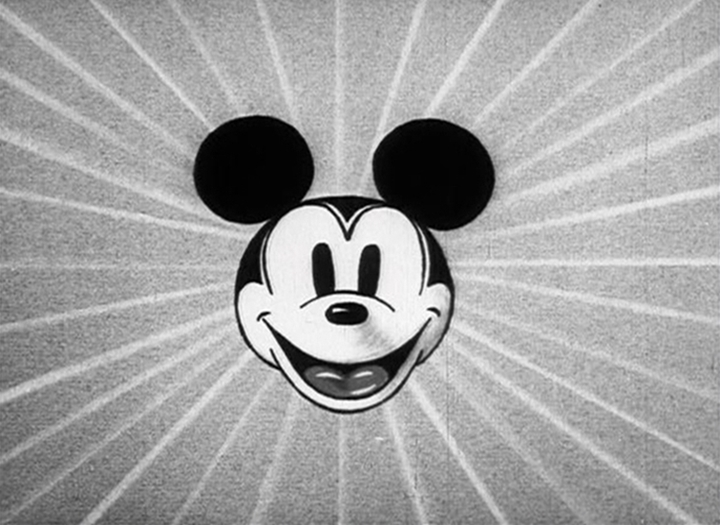 Mickey, Minnie, Horace, and Clarabelle are picked on by a mosquito while camping. When Horace swats the 'skeeter, the little bug flies back to the swamp and rallies his relatives for a full-bore attack on our friends. A version was released in 8mm form entitled "Keep 'Em Flying." 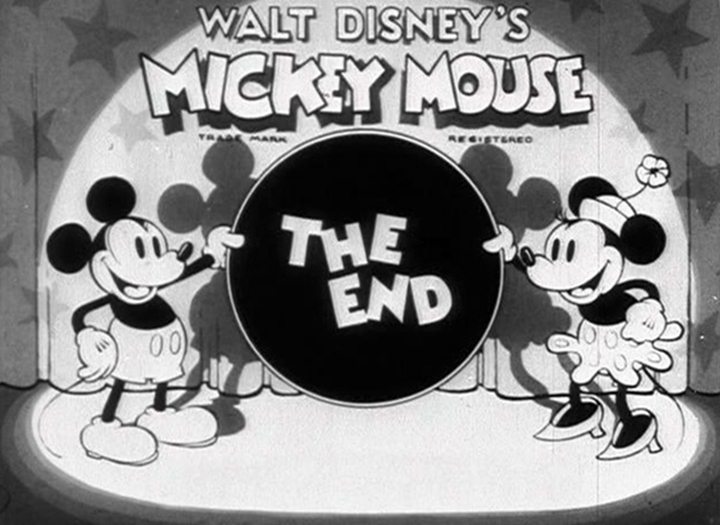 Another version was also released under the title "Mickey's Exciting Picnic." Enjoyable cartoon with plenty of action and gags. I especially enjoyed the scene where a "kid" mosquito, after being swatted, returns to the swamp and cries, "Pop, I was just having fun and some big guy hit me." The entire swamp of mosquitoes then go on attack. The colorized version adds to the short for me. I'm sure we've all had problems with bugs while camping. I remember there were mayflies surrounding my camper on one of my camping trips. Well, here we've got Mickey, Minnie, Horace, and Clarabelle just relaxing and having a good time minding their own business. Suddenly, a little mosquito goes and bugs them. He's swat and runs back to his father crying. Well, before you know it, there's hundreds of the pesky little critters swarming around the happy (soon to be not-so-happy)campers. 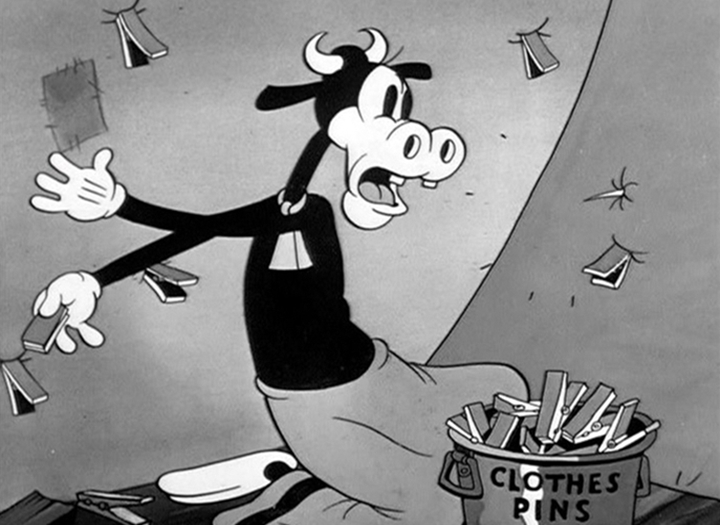 One fun scene was when they tied Clarabelle's bloomers to a pot-bellied stove (at least I think that's what they did) and the mosquitoes flew in and ended up in the bloomers. The bloomers are then seen darting off into the distance. Horace Horsecollar is the real star in this very nice short. I like this character and it's a pity that he had to slowly disappear after Mickey teamed up with Donald and Goofy. I rate this highly funny short with 10 points, because of the music. I find it's the best music of all the shorts - and that say a lot! This was a little different Mickey. This time instead of just battling Pete or some other villain who kidnapped Minnie, Mickey has equal help from Minnie, Horace and Clarabell. And the fight is with some pesky mosquitoes bent on ruining their picnic. The short starts out with some snappy music which is why Walt's cartoons are heads above all others. The music is always a nice touch in all the shorts. This was a lighthearted battle, full of gags, fast and furious. It was nice to see Mickey with a little help this time! Also, this short shows that Horace Horsecollar and Clarabell are great supporting characters. I feel they always made a huge contribution to any toon they were in. This also shows that all the characters can be given equal amount of gags and situations where no one overshadows another. This is again a tribute to the storywriters in the beginning. Just a fun short. 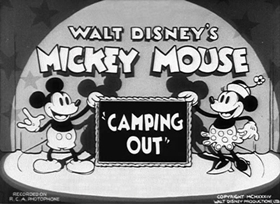 Camping Out is one of the few cartoons in which Mickey, Minnie, Horace Hosercollar and Clarabella Cow are portrayed as four close friends. This friendship was quite commonly portrayed in the Mickey Mouse comics of the time, but on screen it was shown only twice (the other instance is The Beach Party of 1931). This time they are camping out, but soon they're troubled by an enormous army of mosquitoes. This is a pure gag cartoon, and the gags are ingenious and come plenty, making Camping Out one of the most enjoyable cartoons of the era. Some of the mosquito gags were copied in the Betty Boop cartoon "There's Something About a Soldier", released six months later. 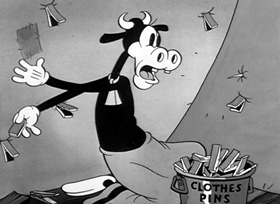 Horace Horsecollar should have had his own series, because by watching this cartoon, it shows that he and Clarabelle could have possibly shared a series. Donald' main focus was his temper, and Goofy's main focus was his stupidity and clumsiness. Horace's focus was that he thinks of himself as a man, and at times his sense of humor or mild temper would cause actions, for example in this cartoon, the mosquitoes keep on stinging his behind, and Horace takes advantage of the situation and puts a waffle iron over it, tricking the mosquitoes. Horace should appear in more Disney media, as Clarabelle has already. 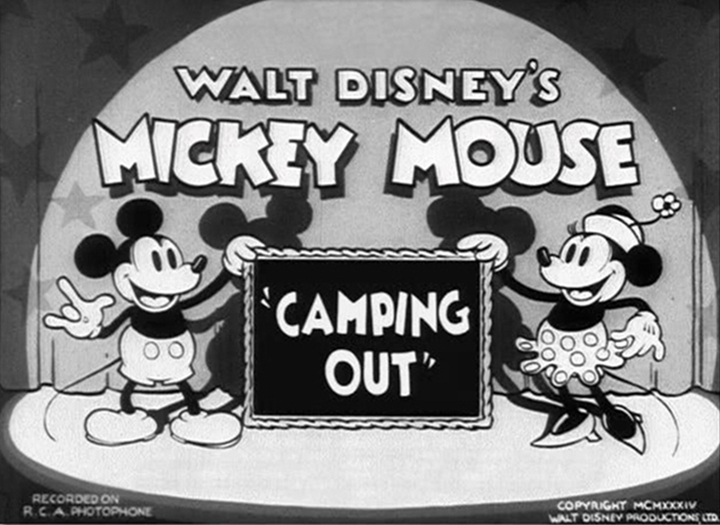 Camping Out is a nonstop gag fest with Mickey and the gang, and as such, is probably the funniest Mickey short in quite a while. 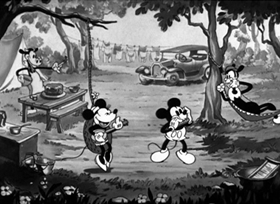 It’s also one of the few that features Mickey and Minnie hanging out with Horace and Clarabelle. But the stars of this short are the mosquitoes. Things start out innocently enough, with the four friends enjoying a camp out. 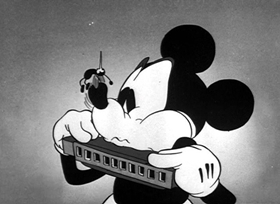 Clarabelle is baking, Minnie is tending the camp, Mickey is playing harmonica and Horace is relaxing. It’s very interesting that this is one of the few times these four are together. We’ve seen it a couple times before, but as Horace and Clarabelle begin to fade into oblivion, it’s nice to see them in this short. 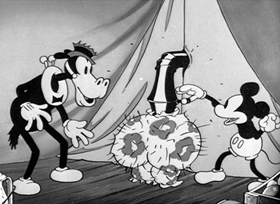 A mosquito starts messing with Mickey, and Horace and Mickey swat it away, bending its stinger. 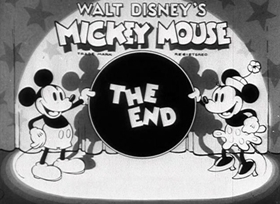 When the mosquito reports back to its parents, then war is declared on Mickey and the gang, and the fun truly begins. 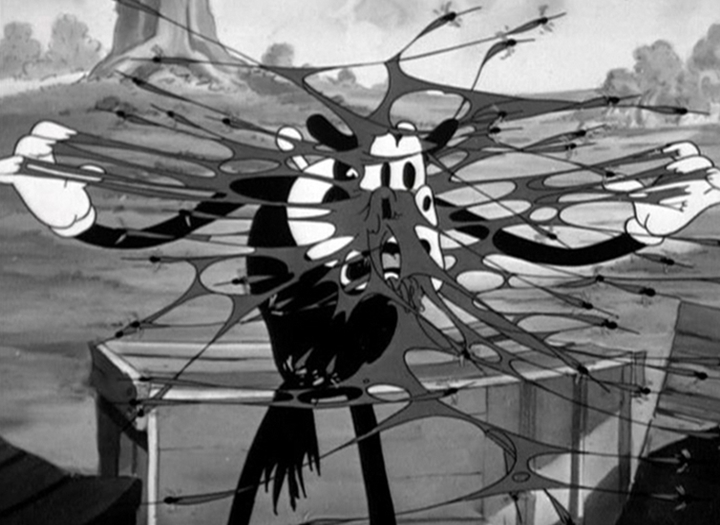 From the moment the mosquitoes appear on screen, the gags come a mile a minute. 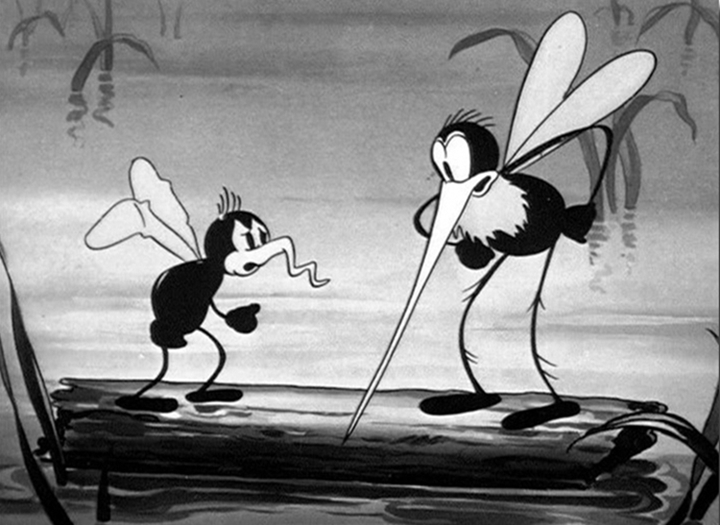 They are fun gags, with the mosquitoes attacking, and the gang trying to repel them. The action starts out in the camp, with the group using their picnic food to attack. Mickey loads up a can of peas and fires them at the mosquitoes, impaling the peas on their stingers and weighing them down. Horace fires molasses at the mosquitoes, sticking them to a tree, and then to himself. That’s just a couple of examples. The work on the gags in this short is the best of the Mickey shorts in quite some time. There are so many that it’s impossible to list them. One of my favorites is seeing the mosquitoes lift Horace off the ground when he opens an umbrella to shield himself from the onslaught. Even with Mickey hanging on, the mosquitoes still get him up. When Mickey and friends retreat to their tent, there are even more. The mosquitoes attack Horace’s backside when he is backed up to the tent, so he decides to one up them. Placing a waffle iron on his behind, Horace presses up against the tent, and the mosquitoes attack, denting their stingers. A neat gag follows as the mosquitoes get their stingers straightened out by a pair of pliers. 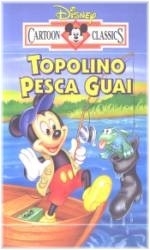 It’s Mickey who provides the final solution for the mosquitoes. He funnels a pipe from the tent into a pair of Minnie’s bloomers, trapping the bugs inside as they enter. This provides Horace the opportunity to kick the mosquitoes in the rear end as they leave. It’s noteworthy how much of this short revolves around Horace’s actions. It’s easily the most work he has done in these early shorts. His gags are the funniest, and his actions are a driving force throughout. Certainly the best short for Horace fans. Another really good one and also another in which Mickey doesn't speak. In addition to the fun gags and Horace and Clarabelle action, the other great thing is the music. I always mention the music in these comments, but the music that opens this short is just wonderful – I love it! I think it's an original tune since I've never heard it any where else, but if any of your readers know otherwise then I'd love to know where it's from!